← Thank you awards: These people made paid sick days possible! 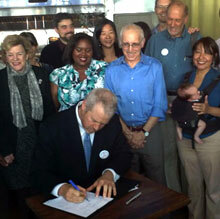 Tasha West-Baker, second from left, watches Seattle Mayor Mike McGinn sign Seattle's Paid Sick Leave bill into law. Getting Her Due: Ever noticed a sniffling check-out clerk when going through a grocery line and wondered why they didn’t stay home? Tasha West Baker says some of them can’t afford to. Tasha works as a checker at a local Safeway store in Seattle. She became an activist to get paid sick days and she helped change the law there. This entry was posted in Business productivity, Family values, Healthy workers, In the news, Paid sick days, Personal story and tagged american public media, City council, Paid sick days, Safeway, seattle, seattle city council, Sick leave, tasha west baker. Bookmark the permalink.